SMELLY waterways in the district will be subjected to a new, green method of dealing with pollution. Floating “ecological islands” on the Xiachangpu River. 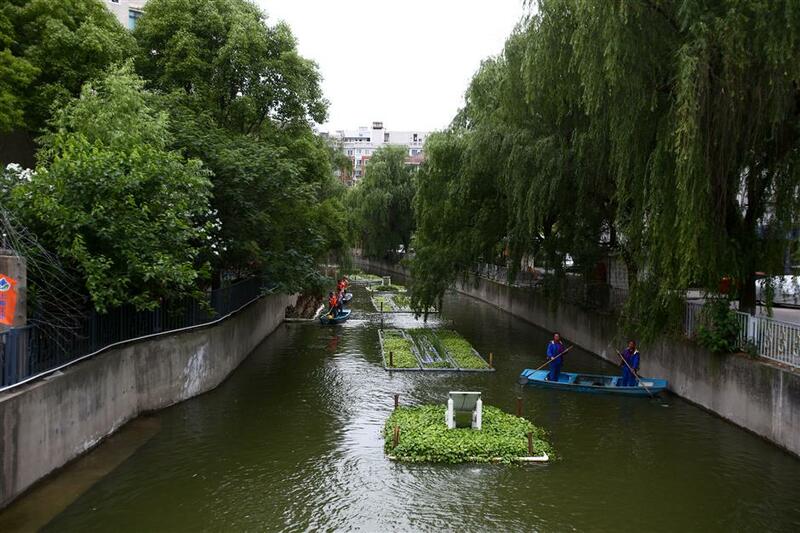 Floating “ecological islands” have been created at eight sites. Plants growing on top of them will stretch their roots into waters below, absorbing nitrogen and phosphorous. 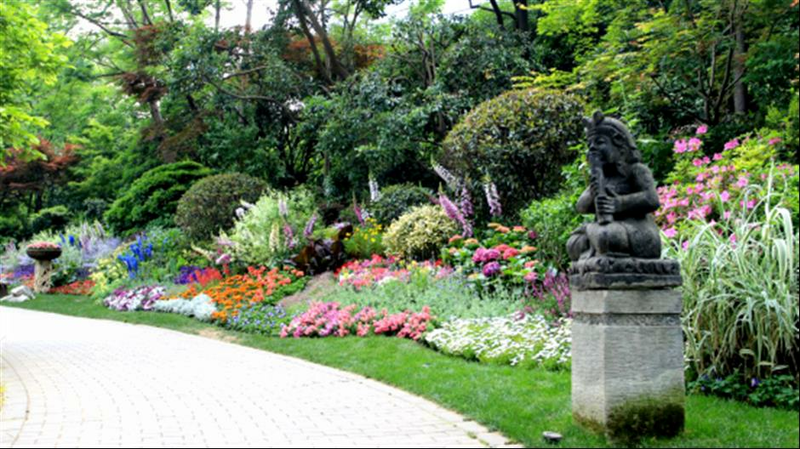 The pseudo wetlands are but one element in Jing’an’s plans to turn itself into a world-class eco-district with clean waterways, riverbank promenades, greenbelts, gardens, outdoor sculptures and recreational areas. “We want to build an ecological city that competes with London and New York,” said Gong Mingjun, deputy director of the district’s green management authority. The river clean-up project is attracting public attention. In addition to purifying waterways, the creation of floating islands is expected to attract birds and butterflies, and beautify the surroundings for local residents. One floating island is on the Xiachangpu River in Pengpu Town. Roots of the plants on the island help clear the water of excess nutrients and toxins by attracting microbes that break down pollutants. Also, bio-film carrying microorganisms is added to help degrade heavy metals. The creation of the islands is combined with an aeration technology using what looks like solar panels on the islands. They help increase the oxygen levels in the water. Residents are happy to see clean waterways. 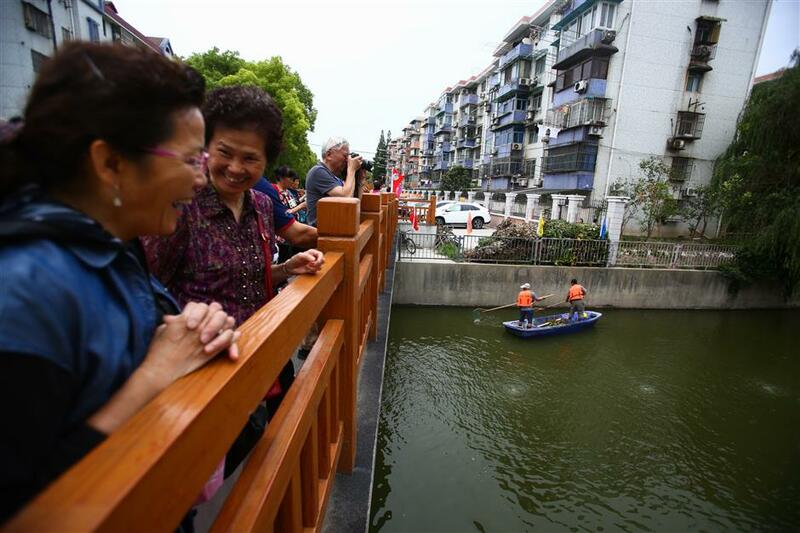 The Xiachangpu River is now looking a bit greener and cleaner, according to about 30 residents who were invited to view the project’s progress and form the backbone of a community group to take charge of it once completed. Jing’an has 12 rivers and waterways, stretching nearly 28 kilometers. A massive cleanup campaign that began about 20 years ago is scheduled to be completed by the end of this year. It’s not only the water that needs cleaning up. Along the banks of many waterways, jerry-built illegal structures have been erected. They are not only health and fire hazards, but they also spew raw sewage into the waterways and create garbage dumps on their banks. So far, the clean-up campaign has removed 70,901 square meters, or a size equivalent to almost 10 soccer fields, of dilapidated housing, garbage dumps and small, polluting workshops. So far, 30 kilometers of riverbanks have been cleared, and they will be turned into greenbelts, promenades and parkland. The ongoing clean-up campaign of riverbanks. 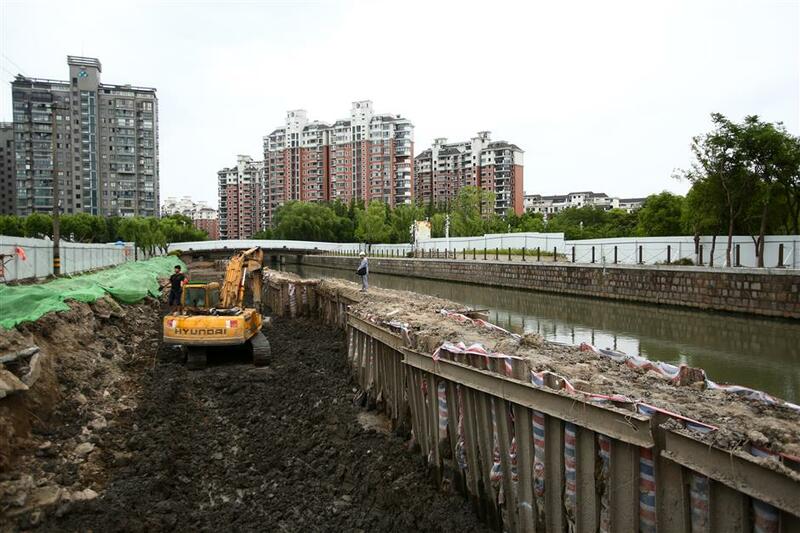 A greenbelt area installed along the Dongjiaojing River is designated as a “sponge city.” It contains underground equipment designed to store and purify rainwater for use if required. Above ground, the greenbelt is planted with trees and shrubs, including ginkgoes, camphor trees and cherry trees. Benches, two basketball courts and a 400-meter-long pathway have been installed. ‘We hope residents can get out and enjoy the changing seasons there,” Gong said. Residents near the clean-up zones are effusive in their praise of the transformation in their communities. “We are really looking forward to riverside parkland where we can gather along the Mayibang River,” said Wu Dongsheng, a resident of the Daning Community. 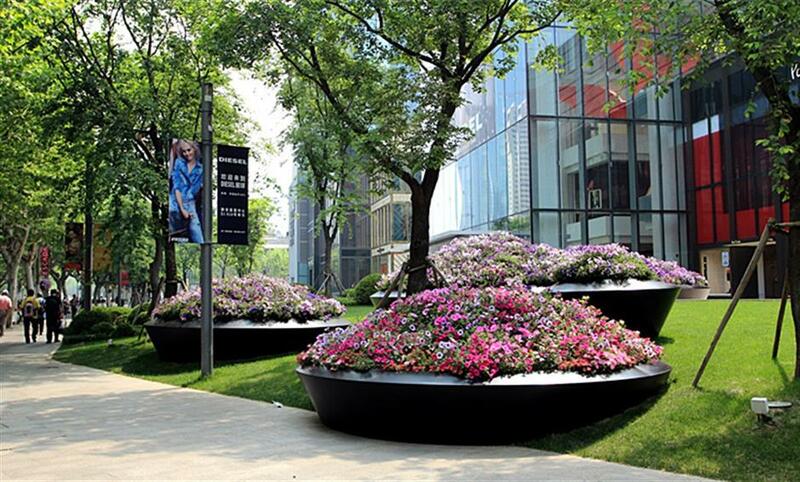 The block of Jing’an Kerry Centre, featuring mini-garden, verdant path and eye-catching statues, is the first manifestation of Jing’an’s green block vision. 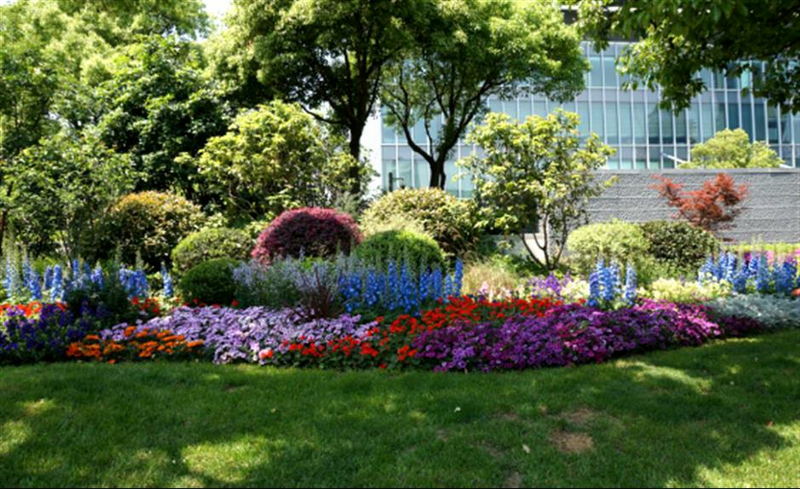 Cleaning up waterways and clearing riverbanks are only part of the “Green Jing’an” plan, according to Gong. “We will level old, dilapidated blocks and create distinctive public spaces that include gardens and sculptures,” he said. 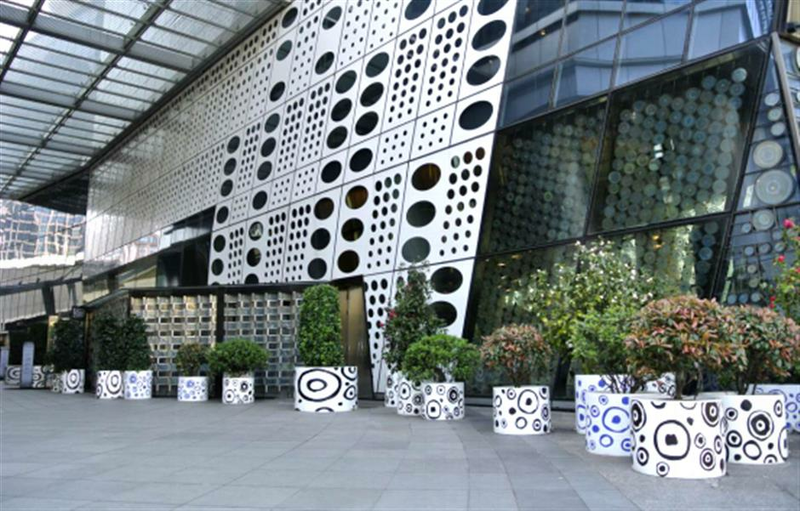 The block of the Jing’an Kerry Centre underwent a facelift in April. The area is bounded by Nanjing, Huashan, Yan’an and Tongren roads. So, Gong worked on a plan to highlight the characteristic of the block. 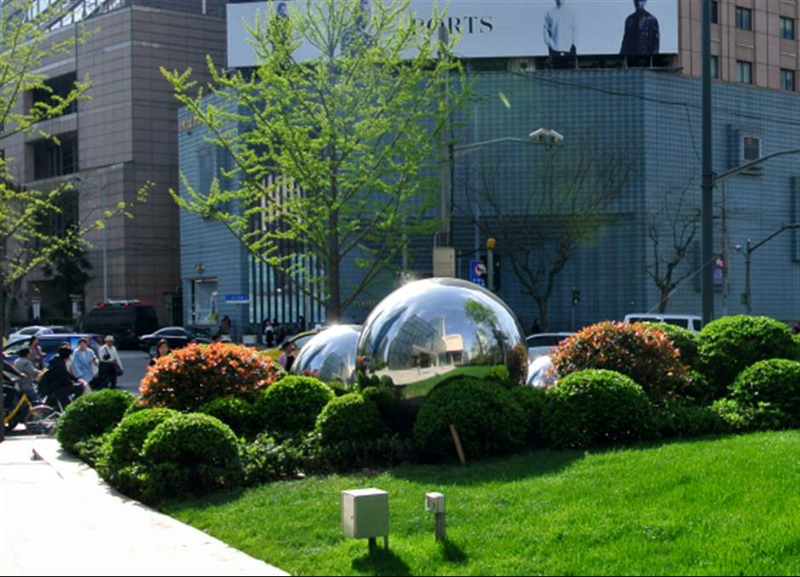 Giant stainless balls have been added to the corner of Changde and Nanjing roads to reflect off the surrounding glass office buildings. 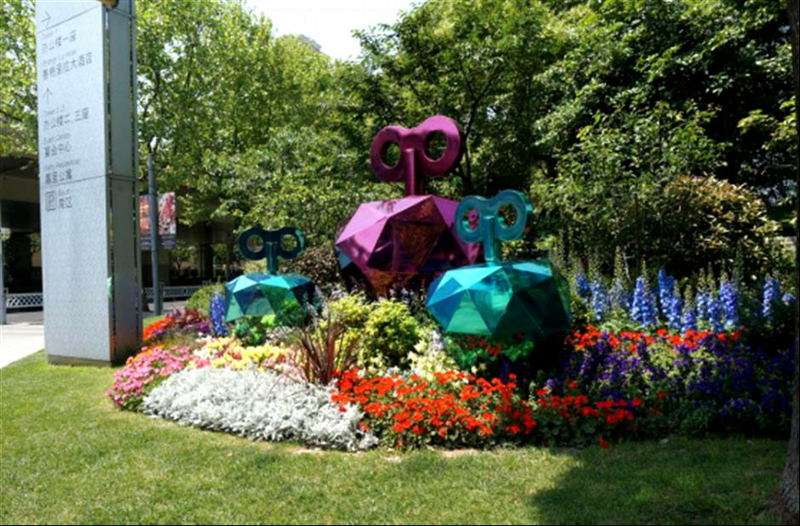 Three colorful fruit-like statues now stand in the newly designed mini-garden at the corner of Tongren and Yan’an roads, and bellflowers, daisy bushes and dusty miller have been planted to create an English country garden effect. A 210-meter-long flower belt of foxglove has been planted along the Yan’an Middle Road. 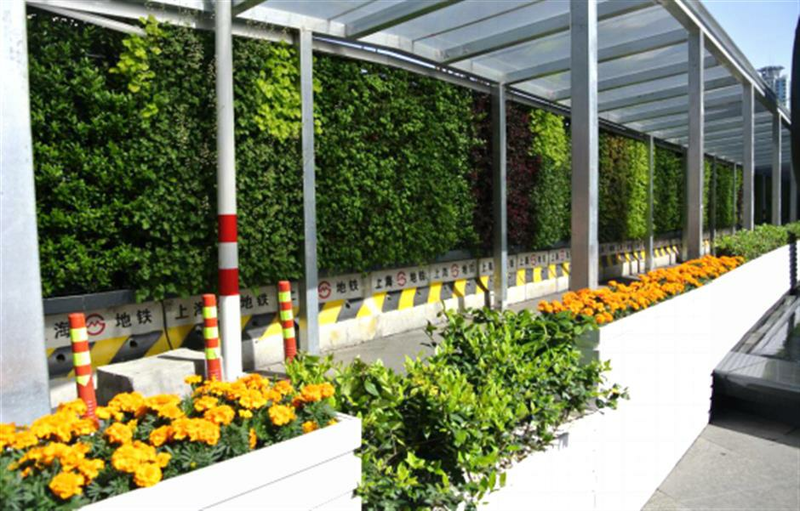 The walls that set off the construction site on Metro Line 14 are all covered in plants. What’s next? Something new at the Shibei High Technology Park, but plans are still under wraps.